I went into the battle totally un prepared. What battle you may ask? Well, it wasn’t really a ‘battle’ per say. Elementary school is a place of learning. A place of reading, writing, arithmetic, jump rope, and dodgeball. But hidden between all the learning and fun and new friends is a deadly little bugger called germs. 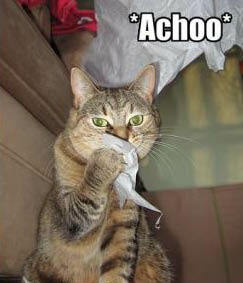 Yes, I have caught the nasty cold that descended upon my school. At first I thought it was just a reaction to all the haboobs we have been having lately. Maybe I sucked too much dust up my nose? Today, when I went to choir and opened my mouth to sing, I realized it was much more than dust. I have very little voice today. The space that used to be filled with ‘voice’ is now filled with the stuff that keeps running out my nose and making me sneeze. Needless to say, I am not a happy camper. So, here I sit at my desk writing. I could use this time to do the filing I have been putting off. I could use this time to stamp some birthday or thank you cards. I could format the recipe book I’m planning to make on My Digital Studio. I could even…..oh heck. I feel like crap. I’m gonna eat some chicken soup, take a nap, and hope I feel better before the family gets back from church and we do Ethan’s birthday celebration. Cause I said so. This entry was posted in Beckie and tagged chicken soup, cold, dust, germs, school, sick, sneeze. Bookmark the permalink.